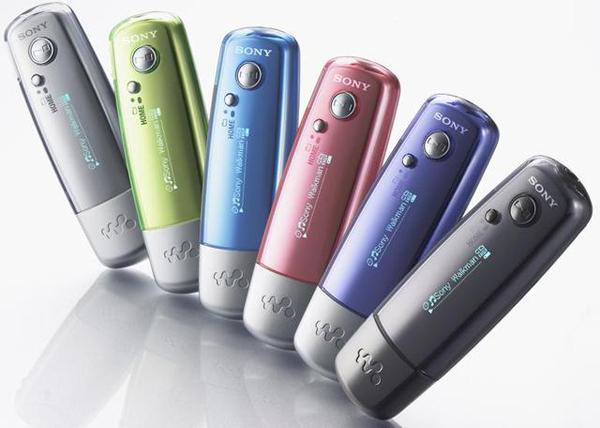 Sony also uses very powerful batteries allowing longer lasting battery life than any Apple iPod. With their quick charge technology, 3 minutes of charging offers 3 hours of playback. (total battery life ~28hrs) Sony has finally been able to get licensing from Microsoft so that they can play WMA (DRM-Free) files along with Mp3 and Atrac formats. Unfortunately purchased music can only be played on this walkman if they are downloaded from Sony’s Connect Music Store. ($0.99/song) Sony also bundles SonicStage, management software, which is very similar to iTunes. We had tested an older E-Series walkman, the NW-E407, and it was in fact much more robust than the iPod Shuffle. The new Walkman will be available towards the end of April 2006, but no prices have been set. If the prices are reasonable we would recommend this over the iPod Shuffle because of the FM tuner, battery life, and display. Please check back for any updates. They’re really great players; and with regard to the Gizmodo story about Sony’s next iPod killer, (since I can’t post on Gizmodo yet), I think Sony would have every chance to topple the iPod with its players if it would just abandon the infernal SonicStage software. At least in my opinion, the software has been the nasty thorn on Sony’s rose ever since the first days of NetMD. It’s not that I mind SonicStage that much. Earlier version were crash-prone and slow, but the more recent versions are quite stable and do a decent job of managine music. What I do mind is that, at least with my NW-HD3, I have to use Sonic Stage. That limits me to using Windows, which isn’t my OS of choice. Regardless of OS choice or any of this, it’s frustrating that we are *forced* to use their software. Would be nice to have some options. Because it sure is nice having 50+ hours of battery life on a charge. does this mp3 player allow us to store other files? like a usb drive? This does indeed work as a normal thumbdrive, but the playback features will only work if the media is placed in certain folders, which SonicStage (Connect) takes care of. If you have a MAC, unfortunatley Sony doesn’t currently have any support for transfering music back and forth, however this should work just fine for thumbdrive capablities.